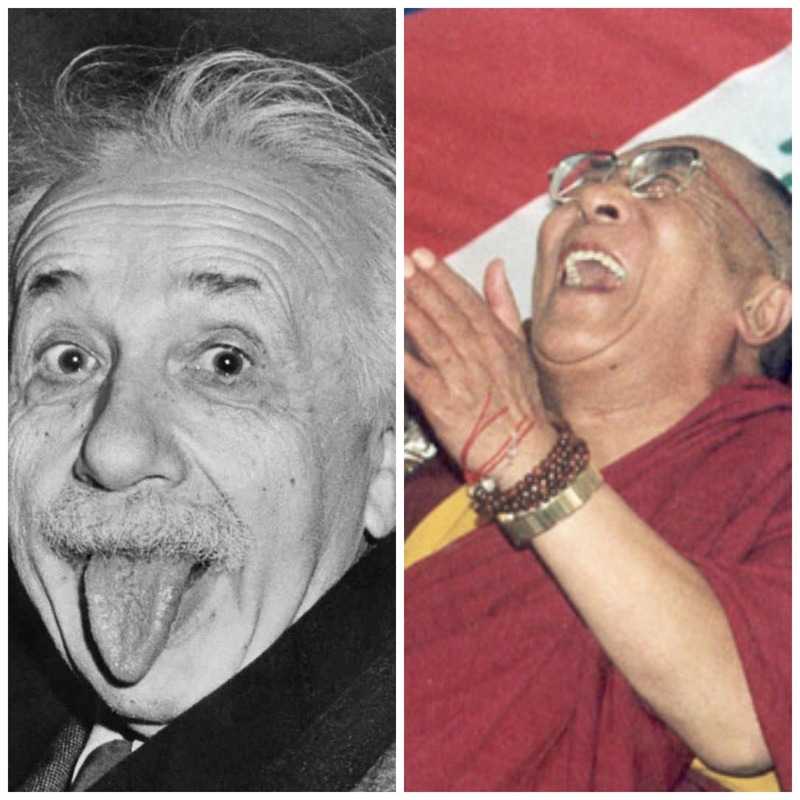 One thing science and religion agree on is the medical benefits of laughter. And if that’s not a basis for friendship, I don’t know what is! a particular area of this. It would be fair to say that science is based on empirical observation and study, and that the scientific method uses trial and error–experimentation–to determine whether a hypothesis is plausible. What has always bothered me about people who dismiss religion and spirituality, though, is the unscientific way in which they do so. The spiritual world is dismissed out of hand, as if it did not rise to the level of something that could be empirically investigated. Whenever an idea is dismissed without even giving it a fair trial, I think it’s reasonable to wonder whether bias is at work. And I think that is the case when it comes to science and spirituality/religion. If we dismiss religion in the name of science, we can only do so by making the argument that the empirical experiences of the millions of people who say that they have experienced the presence of God(s), or who say they have observed miracles, or for that matter who say they have seen ghosts, are not admissible evidence. But if the empirical experiences of SO many people are not admissible as evidence, then we need to be provided with a reason why not. Why are these eyewitness accounts not acceptable to us? The reasons that tend to be provided seem to me to be at least as farfetched as the idea that there could be a spiritual dimension to reality. Let’s see: mass delusion, mass psychosis, mass hallucinations? How likely is that, really? Meanwhile, at the same time, we’re scientifically validating quite a bit of the knowledge that came from these supposedly psychotic and deluded ancestors of ours: their herbal knowledge, their astronomical knowledge, their understanding of the basic nature of reality (ask the Dalai Lama how much of Buddhist cosmology is a very good match for what we’re learning from quantum physics! ), their approaches to stress management, and we’re even finding that there’s science to back up seemingly bizarre (at least to the Western scientific eye) practices such as smudging. Not to mention what we’re learning from science about the value of prayer and meditation. So if I try to explain why we even have such a thing as religion, given our “scientific” belief that the spiritual cannot exist, I’m left arguing that we have psychotic ancestors who made up stories about the world because they were too dumb to figure out how the world really worked, except that they did understand a lot of things about the world that we are just now beginning to be able to provide the scientific back story for. If I want to defend such an argument scientifically, though, I would have to approach it systematically–it’s unscientific by definition to make such a sweeping claim otherwise. But if I take a systematic look at our religious ancestors and their practices, I actually find them to be very scientific in their approach to studying the world. I find that they observed carefully and often journaled their observations. I find that their results were replicated by other people making the same observations all over the world, and that the spiritual technology that was developed by our ancestors (no matter who you are and who your ancestors are) was replicated independently by people from many different cultures. Smudging, for example, is a very common practice among religious and spiritual people (in organized Western religious environments, we call it burning incense, but it is the same thing: clearing the air with smoke). Prayer and meditation, as I’m sure you realize, are practiced worldwide–and now that we have brain imaging technology (such as MRIs and fMRIs), we know that prayer and meditation have measurable, quantifiable effects on the brain that affect any human who practices them. I even find, when I look carefully, that a lot of the religious advice that is provided to us under the category of “moral instruction” is actually simple, practical advice. I have had two people recently get upset with me when I tried to explain to them that lying, for example, is inadvisable NOT because it is immoral (because that’s a matter of opinion) but because it is highly impractical. Lying unravels the fabric of the world in which we live, and when we lie, bad things happen because our world starts to unravel around us. When we tell the truth, the opposite happens: doors start to open for us. I can’t prove that this is so, but I can challenge you to keep a journal of what happens when you lie versus what happens when you throw truth at the situation–I think you’ll find that the preponderance of your own evidence supports what I am saying. While we’re on the subject, let’s note that science certainly doesn’t require us to PROVE everything. There are many ideas in science (and in medicine) that we accept not because they are proven but because the preponderance of the evidence suggests that they are correct. (This is how clinical trials for drugs work, for example.) Sometimes, though, the evidence turns out to have been incorrectly interpreted–in some cases, perhaps there was a spurious correlation that confused the issue–and then scientists reconsider and we see a paradigm shift. It’s usually not so much that the original idea was disproven (though, of course, sometimes that is the case–for example, it’s fair to say that the idea that the Sun goes around the Earth has been disproven–it simply doesn’t). What usually happens, though, is that there is an increasing amount of evidence suggesting that something was missed the first time around–and then scientists have to come up with a theory that reconciles the new contradictory evidence with the original results. Often, scientific ideas are not proven, but instead represent our best understanding of how something works based on the evidence that has been collected so far. But that’s true of religious and spiritual ideas as well. If you look at the way humans relate to the sacred, you’ll see quite a lot of systematic inquiry and data collection. Our brains love to observe, collect, categorize, analyze–whether we are talking about science or philosophy. Our approaches to both subjects are very similar. And frankly, I think that’s part of the reason why so many scientists are so deeply religious. It’s not because they’re schizophrenic or have other personality disorders. It’s not because they have compartmentalized their brains to such a degree that they can actually do science in one hemisphere of the brain and religion in the other. It’s because these two ways of looking at the world are actually not all that different. Like the farmer and the cowman (in the song from Oklahoma! ), science and spirituality CAN be friends.